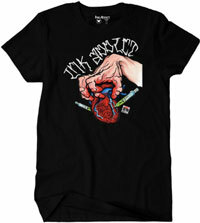 These Ink Addict tattoo t shirts are absolutely awesome. These shirts are not only of high quality, but also look amazing. The one of a kind tattoo art used makes these shirts the perfect shirt for anyone looking to impress their peers or give the perfect gift to someone else. One can choose between several different t-shirt designs including designs with the site’s logo and shirts that contain the logo alongside tattoo art, or pure tattoo art t-shirt designs. The shirts also come in a wide variety of colors from black, teal, red, and pink, among others. In addition, the design themselves come in a variety of colors from vibrant tattoo designs to simple solid color text with the logo, the possibilities are endless. In addition the whimsical designs, such as the Sideshow Women’s Tee and the Kraken Men’s Tee, are truly unique and one of a kind designs. Similar designs cannot be seen anywhere else, and even if they were, there is nothing as eye catching as the designs displayed here. The use of color, design, and visual space makes these shirts very eye-catching. The use of colors makes for a very vibrant and bright t-shirt print that is truly to die for. In addition, the art design used is very visually captivating due to the uniqueness of the prints. These shirts would provide for the perfect shirt for a casual evening at home, or even a night out as they are both original and visually appealing. They can be dressed up by adding a dressy jacket or dressed down by wearing with sweat pants, which makes them all the more appealing as they can be worn to a wide variety of events. This alongside with the beautiful unique artwork used and the attractiveness of the logo makes these shirts the perfect item for anyone interested in tattoos or who is simply an art enthusiast. The shirts can be appreciated by anyone who is interested in wearing something unique and looking independent. These shirts are also designed for the truly creative and the tattoo fan making them not only perfect for oneself, but also making them an excellent gift. This entry was posted in Apparel on January 17, 2013 by Yami.